Take her to the moon for me. Okay? The Pixar Theory, or “Grand Unifying Theory of Pixar movies” if you want to be more intense, is a fan theory I wrote in 2013 about how every single feature film made by Pixar Animation Studios is intentionally set in the same universe. Or unintentionally, if you believe in miracles. I was inspired by an episode of the Web Series, “After Hours,” on Cracked.com. In the episode written by Dan O’Brien, the After Hours crew discusses, at length, how a few of the Pixar movies may secretly be about the apocalypse. They address Toy Story, WALL-E, and Cars before giving up because they can’t find a way to connect the films any further. Over the following year, I developed my own theory on how all the movies connect, and the results have been surprisingly epic. People from all over the world have read the theory, and many of you have been having ongoing discussions in the comments that go way beyond anything I first imagined (trust me, I read all of them). Now, two years later, it’s time to see where we’re at as we welcome a new Pixar movie to the world: Inside Out. First, it’s important to point out that the theory itself has changed dramatically over the years. A lot of people have called out flaws and underdeveloped points of the theory that make it fall apart for them. I’ve read the feedback and spent the last two years writing a book that fully fleshes out my original theory. It addresses pretty much every major complaint and issue that “debunkers” have thrown at it. And it does this in about ten chapters. Every chapter follows a specific movie (some are lumped in together, like the Cars franchise). I talk about the context of the movie as it relates to this theory, where it fits in the grand timeline, and how each movie contributes to the idea that these movies exist in the same narrative. And yes, I go way beyond the easter eggs. My book is available now on paperback and all e-book stores. Hope you guys like it! But let’s get back to the main task at hand. Let’s talk about how Inside Out masterfully fits within the idea that all of these Pixar films are connected. 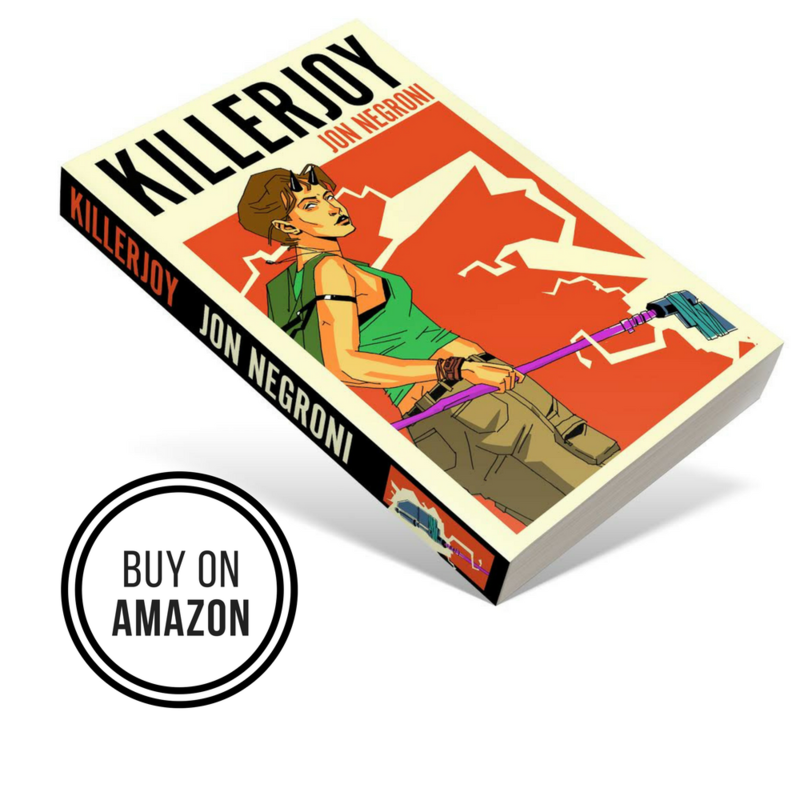 What you’re about to read is set up like how I wrote the chapters for my book, so if you like what you read, then that may be a sign that the book is for you. Consider this your sample chapter, if you will. Obviously, many spoilers are ahead, so read at your own risk. I highly recommend that you watch the movie at least once before reading this, especially since it’s pretty fantastic. You’ve been warned. Inside Out is the story of a young girl struggling to grow up, seen through the eyes of her emotions as literal beings. Yes, Pixar made a movie where feelings have feelings. The movie opens with the birth of Riley Andersen. The first thing you may notice is that she shares the same last name as Bonnie Anderson from Toy Story 3 and the subsequent shorts based on that movie. That may tempt you into believing that Riley and Bonnie are connected somehow, but that’s definitely not the case since their names aren’t spelled the same way. Anyway, we learn early on that Riley grew up in Minnesota, but her family moves to San Francisco when she’s 11 years old. Now it’s true that Bonnie lives in Tri County, around the corner from Andy, and Tri-County does take place in the Bay Area of California. But that’s really just a coincidence. Riley’s family never mentions that they have relatives around, and they only moved to San Francisco for her dad’s job. For that reason, all signs point to this being a coincidence. Moving on, we get to know Riley through a montage of her early life. When we get to the point where she’s 11, it appears to be modern day. Much of the technology we see throughout the movie — like a Skype surrogate that closely resembles the one used by Trixie in Toy Story 3 and the presence of smartphones — point to this being a film set in 2015. That means Riley was born in either 2003 or 2004, depending on her exact birthday. Interestingly, that would mean the movie opens during the same year as Finding Nemo. We also know that this has to be some time after 2007, which is when Ratatouille takes place. In fact, Inside Out actually confirms that Ratatouille takes place in 2007 instead of 2004, which is a conundrum I ran into while writing the book. It’s all based on the blurry date seen on Gusteau’s will and…eh, don’t worry, it’s not important. Anyway, the reason we know that this is some time after Ratatouille is because you can see Colette Tatou on the cover of a magazine in a blink-and-you’ll-miss-it easter egg. Judging by the prestige of this magazine, Colette has done well for herself during her years learning from Remy and working at La Ratatouille, the bistro she started with him and Linguini. After all, why would she be on the cover a magazine before her adventures in Ratatouille? Before she met Linguini, she was just a hardworking chef trying to build a career at a failing restaurant. I find it much more plausible that she’s created a name for herself under the tutelage of the best chef in France. (DONALD GLOVER VOICE) MY EMOTIONS! So as we get to know Riley in the film’s early montage, we meet her emotions. The film immediately takes us inside her head, where we watch Joy, Sadness, Disgust, Fear, and Anger team up to influence Riley’s actions. They work in “Headquarters” (get it?) and use a mysterious console to control Riley’s decisions. When an emotion manages to elicit a meaningful experience in real life, a memory is generated and sent to Riley’s long term memory. If it’s a specifically powerful experience, then it will create a core memory that will stay in Headquarters. It’s somewhat confusing, but Pixar does a great job of explaining this better than I can. They use subtle techniques and cleverness to make the inside of Riley’s head immediately unique, while also incredibly believable. For example, the memories are shaped like “marbles” because without them, Riley would lose her marbles. The plot of Inside Out focuses on Riley being uprooted to a new home in San Fransisco and how this negatively affects her emotions. She misses her friends, never sees her dad anymore because of his new job, and feels pressured to just “be happy” all the time. This causes her to repress her sadness, which eventually causes even more problems. There’s another fun cameo during this part of the movie. We see a rat that looks a lot like Remy, which is just a fun reminder that Pixar animation transcends the multiple stories they tell. And we also see memories that feature other Pixar characters. You can see Carl and Ellie’s wedding from Up for example. A good reason for that could be that Riley saw a tape of this wedding at some point, though that would have to be a very old home movie. It could be a picture, since we see a camera in the first frame of that scene in Up. In that case, Riley could have seen that picture and imagined the wedding herself. This has led a lot of people to think that Riley could somehow be related to Carl and Ellie, which would be quite a stretch. That’s because Carl and Ellie sadly never had kids, so Riley would have to be a distant relative. If she knows about the wedding, then she’s probably met some of this family, but we know in those early scenes of Inside Out that Riley is visiting California for the first time. She thought the Golden Gate bridge was actually golden, after all. You could argue that people from this family went to Minnesota to visit her, but I’m not really convinced. Personally, I don’t think we’re able to know just yet, though one theory I have is that she had a teacher or friend’s parent who is somehow connected to Carl and Ellie. A future Pixar movie may shed light on this. Some people even want to believe that Riley is Boo from Monsters Inc.,or Andy’s mom. Seriously. Look, Riley is Riley. She’s not anyone else, and trying to force these connections is missing the point. 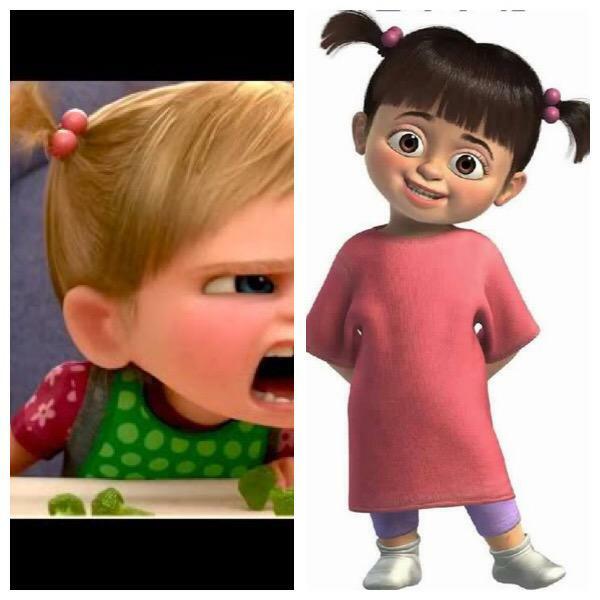 For example, the primary reason people think Riley is Boo is because when she’s shown as a toddler, she’s wearing the same hair tie/scrunchy thing that Boo wears in Monsters Inc. They both even have pig tails. If you’re fixated on them being one in the same, then you miss the cooler reveal, which is that Riley was growing up around the same time as Boo (Monsters Inc., takes place in the early 2000s), so of course that style and those hair ties were popular. As for Riley being Andy’s mom…I mean that’s way too much of a stretch, even for a limo. Besides the eyes, nose, time period, and basic facial structure, they’re exactly alike! Sigh. A main theme of the Pixar Theory is the idea that humans emit this strange energy that we see all throughout the films. In Monsters Inc., we learn that the laughter of a child can be harvested as energy for a society of creatures that mysteriously know how to use it. In The Incredibles, this energy is seen tangibly through the exploits of super-powered humans who can do amazing things. Part of my Pixar Theory (the updated version) is that humans power the toys in Toy Story because they’re built to collect energy by the machines from The Incredibles. The book goes more into detail, but the basic idea is that the machines know how to use human energy as a battery, which carries on as a strategy all the way to the future, when monsters have to go back in time through doors to access this energy because no humans are left thanks to WALL-E. But all this time, I’ve wondered why Pixar seems so infatuated with this idea of imagination being a raw power. And Inside Out addresses this pretty head on. The whole premise of the movie is that our emotions (as seen in Monsters Inc.,) are what truly power our actions. And the most powerful emotion for a child is Joy, as seen by Joy being the de facto leader of Riley’s emotions. Most of Riley’s memories are positive, and this is because Joy is inherently a strong emotion for many children. The monsters of Monsters Inc, use fear, which can be another strong emotion for some kids, to power their society, but they eventually learn that laughter from joy is far more effective. And why is that? Well, Inside Out explains that joy is one of the first emotions we experience. Joy, the character, is a literal light source. She’s fast, tough, and clever. And she’ll do anything to make Riley happy. The other emotions in comparison are much more passive. A lingering question in Monsters Inc., is why adults are so difficult to scare. Inside Out sort of answers that by showing how the inside of adults’ minds work. They’re more emotionally balanced, for example, so you don’t see one emotion overpowering the others. When we see inside the heads of Riley’s parents, the emotions don’t bicker like they do in Riley’s head. Instead, they all work together to accomplish the same goal. But that’s not all. No, no, no. There’s something even better hiding in the dark of this movie that serves as the biggest “Aha!” moment I’ve had since I carefully re-watched Brave and Monsters Inc., back to back. And it has to do with this guy, Bing Bong. So what’s the big deal? Why is he important? Simple. Bing Bong is an imaginary friend, yes. But he’s based on a monster. Riley’s monster from when she was three. At the end of Monsters Inc., Sulley and Mike decide to make kids laugh instead of scream because it generates more energy and is less messed up. We even see Mike go through a door and perform standup comedy for a child. But wouldn’t this leave a kid feeling traumatized? Imagine a monster coming through your door, making you laugh, and then disappearing forever. This would make no sense unless…children perceive these new monsters as their imaginary friends. Bing Bong was a monster who went through Riley’s door and made her laugh when she was three. We know that monsters have animal characteristics, explaining his part-cat/part-elephant appearance. And of course Riley thinks he’s made of cotton candy. Why else would he be pink? I’d even argue that he makes dolphin noises to make Riley laugh, causing her to think he’s part dolphin, too. This all makes perfect sense if we’re to believe that well-adjusted kids in Pixar movies grew up meeting monsters in their rooms late at night. And it’s further helped by the fact that in Riley’s subconscious, she’s afraid of clowns, not monsters. And think of it this way. Isn’t it pretty easy to picture Bing Bong living in Monstropolis? I have plenty more to say about all of this, but those are the major points. If you want to keep digging, you can read another exploration I did of this movie that goes somewhat more into detail. The gist of it is that Bing Bong is life. There’s a globe in Riley’s classroom that has been shown in every single Toy Story film. Some of the cars in San Francisco have bumper stickers from the Pixar movie, Cars. One of Riley’s classmates wears a camo shirt with Toy Story characters on it. Well, their silhouettes, at least. It even looks like Arlo from The Good Dinosaur is on there as well. There’s even a popular girl at the school with a skull t-shirt in the same fashion as Sid’s from Toy Story, just in a different color. The 90s are making a comeback! A banner in Riley’s hockey rink showcases a team from Tri-County, which is the setting for Toy Story. I explain this easter egg further in a different article. Blink and you’ll miss a “For the Birds” cameo during Riley’s road trip to San Francisco in the beginning of the movie. It’s just like their appearance in Cars. As always, the animators included ample A113 references. I’ve heard there’s more than one, but the only one I saw personally was A113 as the number of Riley’s classroom. 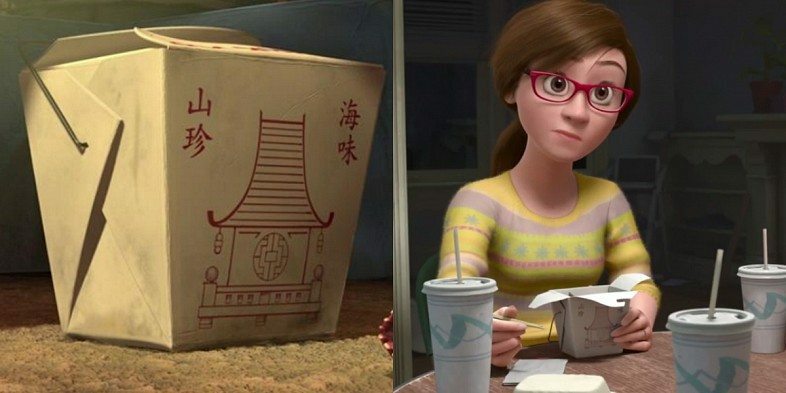 If you look closely at Riley’s Chinese takeout box, you’ll notice it has the same design as the one from A Bug’s Life (pictured below). Those familiar with the theory know that this could be because the same restaurant exists in both movies, so naturally there’d still be remnants of these takeout boxes hundreds of years later during Flik and the gang’s adventures. In Inside Out we see that dogs & cats have emotions. Hoooooooooooooy crêpe. If emotions ARE the energy that machines & toys so crave from humans, then that means animals can also be batteries. The Good Dinosaur, animals live & evolve on their own, before any human relationships. Finding Nemo, fish are isolated from humans entirely, under the sea. Ratatouille, Remy is cooking even before Linguini. If anything, humans hold animals back. They keep dogs from their full potential, like Buster in Toy Story 2, the dogs in Up (& that’s even with just ONE human! ), the humans in Finding Dory & Nemo (kidnapping), & in Ratatouille the old woman disrupts the entire rat nest. I propose that Monsters in Monsters Inc. don’t need human interaction. Monsters Inc. lore says there was a time before the doors, before power. Monsters University has a deleted scene involving Monster history, when scream energy was just being discovered & explored. See, humans are still just powering machines! They power the Monster homes, their cars. It’s their electricity! The Monsters can live without it as much as we can. Humans=batteries, but only for machines. I’m curious to hear your opinion on why Riley has mixed gender emotions. Well, I know I’m not Jon, but what I’ve heard is that since Riley is younger and not as mature as some of the other charecters, her emotions aren’t the same gender. Gender-wise, they’re as mixed up as her feelings. I’ve also heard that it was because the director saw certain emotions (i.e, Fear and Anger) as male, or that the writers thought it would appeal more to young boys. Intercept it as you will. Well, Riley was a child, and child wasen’t as mature as adults. They can also act like boy, Riley wasen’t very girly in that movie. I have a classmate that’s a girl and act like a boy. Wouldn’t her monster be George Sanderson because bingbong’s legs are the pattern as him. I think that after seeing him, she would create an imaginary friend based in him and then she would make him have featured that she like, such as cotton candy. Did you watch SCB too? I agree that their theory makes more sense. Bing Bong’s legs are the only part of him that isn’t explained at any point. He could theoretically be an imagination-enhanced version of a monster, but Sanderson makes more sense somehow because of those legs. Is there part of the theory that explains where monsters came from? Because humans did return to earth after Wall-E. So unless I missed something (I’m going off SuperCarlinBros here), monsters sort of evolved from people? If that’s the case, why aren’t they still batteries? Shouldn’t the monsters have headquarters, etc, too? Well, maybe. But I think they’re too evolved to be batteries anymore. They could also have crossbred with animals somewhere along the line (ewww), which may have separated them too much from full humans. Hai sir😊😊,how are you?hope you have a nice day.My name is Rama i’m from Indonesia and me is big fans for Pixar film, i was read your blog and i so interesting about your blog but i have a questions for you,can you sending your book to my country and make it that with any language? ?hopefully i wish you can do that,because me and my brother wanna now about pixar theory, i’m still feel confused about pizza planet car,so thanks for make it that happens about pixar,and now is happens you make some book. Dude, no offense but are you purposely making your english bad? Im indonesian too by the way. Did we ever find out why there are no cars in the epic fan photo up top? Sorry I’ve been out for a few months. Oh wow he took it out. Dang it. It was a good picture. This is because Riley is not yet mature/old enough to know what gender she prefers and another thing could be that Riley is not very girly therefore her emotions aren’t all girls. I have heard of many things like the director thinking this would appeal more to boys and him just picturing fear and anger as male characters . So overall there are many reasons that support Riley’s cause of not having just one gender of emotions in her brain. I think inside out takes before finding dory becuase i saw Riley in the movie. Couple years late on this..lol. Anyways, I was thinking that maybe, just MAYBE I know why Riley knows about Carl and Ellie’s wedding. Do you remember Meg, that girl in the memory for “Friendship Island”? It does make sense, Meg having that bright red hair like Ellie and those blue-grey eyes like Carl. And best friends do swap memories, so if Carl and Ellie happen to be Meg’s great grandparents (?) then she may have shown Riley the picture that was taken at their wedding, and Riley may have imagined the wedding from there. But that’s only a little chunk of information. I could be WAY off, or maybe it could be Boo/The Witch up to something again. Or it could just be some Pixar animators trying to fill in some bubbles with past animations to save some time. What do you think?